The <httpErrors> element allows you to configure custom error messages for your Web site or application. Custom error messages let you provide a friendly or a more informative response by serving a file, returning another resource, or redirecting to a URL when visitors to your site cannot access the content they requested. For example, you might want to customize each of the error message pages for your Web site to have the same look and feel as the rest of your site. The <httpErrors> element contains a collection of <error> elements, each of which defines an error message that IIS uses to respond to specific HTTP errors. You can add custom error messages to IIS by adding an <error> element to the <httpErrors> element in the Web.config file for your site, application, or URL. 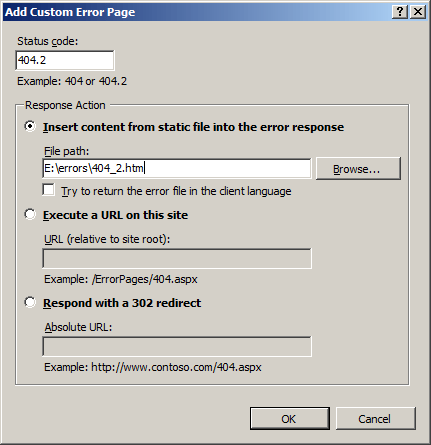 Each <error> element uses the responseMode attribute to specify whether IIS serves static content, dynamic content, or redirects to a separate URL in response to an error. You can use the <remove> element to remove a specific error message from the collection of error messages your site or application inherits from a higher level in the IIS configuration hierarchy. Also, you can use the <clear> element to remove all HTTP error messages from the collection of HTTP error messages that your site or application inherits. The <httpErrors> element also contains attributes that configure IIS 7 to process requests that cause errors. The existingResponse attribute defines what IIS 7 does to an existing response when the server returns an HTTP error status code. The defaultPath attribute defines the path to a customer error page if you choose specify File for the responseMode attribute in an <error> element. The detailedMoreInformationLink attribute specifies a link to more information about a particular error. The <httpErrors> element also can contain an errorMode attribute that you can use to control the level of detail that IIS returns to a browser when an HTTP error occurs. You can set the errorMode attribute to DetailedLocalOnly, which is the default setting, or you can set it to Custom or Detailed. If you specify DetailedLocalOnly, or if you do not specify an errorMode value, IIS returns detailed error information only to the browser on the local server and a custom error message to a browser on an external computer. If you set the errorMode value to Custom, IIS returns only custom error messages to all requesting browsers. If you set the errorMode value to Detailed, IIS returns detailed error information to all requesting browsers. The default DetailedLocalOnly value allows you to troubleshoot HTTP errors on the local server while not exposing sensitive information to external browsers. 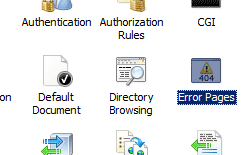 By default, IIS serves error messages defined in files stored in the %SystemRoot%\Help\IisHelp\Common folder. You can create a custom error message for users and configure IIS to return this page whenever it encounters a specific HTTP error on your site. IIS 10.0 The <httpErrors> element was not modified in IIS 10.0. IIS 8.5 The <httpErrors> element was not modified in IIS 8.5. IIS 8.0 The <httpErrors> element was not modified in IIS 8.0. IIS 7.0 The <httpErrors> element was introduced in IIS 7.0. IIS 6.0 The <httpErrors> element replaces the IIS 6.0 HttpErrors property of the IIsWebService metabase object. 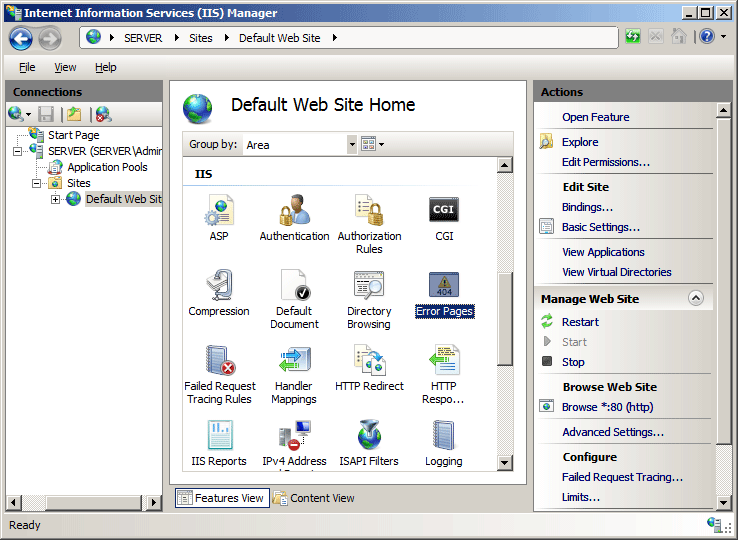 The <httpErrors> element is included in the default installation of IIS 7. You can configure the <httpErrors> element at the server level in the ApplicationHost.config file and at the site and application level in the appropriate Web.config file. When set to true, absolute paths are allowed for custom error pages when the <httpErrors> section is delegated. When set to false, only paths that are relative to the site root are allowed. Specifies the default path of the custom error page. The type of path is determined by the defaultResponseMode attribute. If you choose File, the file path is returned. If you choose either the ExecuteURL or Redirect path type, the URL of the custom error page is returned. The defaultResponseMode attribute can be one of the following possible values; the default is File. Serves static content, for example, a .html file for the custom error. If responseMode is set to File, the path value has to be a file path. 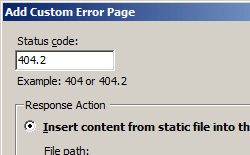 Serves dynamic content, for example, a .asp file for the custom error. If responseMode is set to ExecuteURL, the path value has to be a server relative URL. Redirects client browsers to a different URL that contains the custom error file. If responseMode is set to Redirect, the path value has to be an absolute URL. Specifies a link, shown at the bottom of the page, to a page with more detailed information about a particular error. You can use this property to point end users to a custom location for error information. The status, sub-status, HRESULT and message ID are sent as part of the query string. The default value is https://go.microsoft.com/fwlink/?LinkID=62293. Specifies whether HTTP errors are enabled. The errorMode attribute can be one of the following values; the default is DetailedLocalOnly. Returns detailed error information if the request is from the local computer, and returns a custom error message if the request is from an external computer. Replaces the error that the module or server generates with a custom page that you specify. This mode is useful in providing friendlier error messages to end users. Note: This setting turns off detailed errors, even for local requests. Sends detailed error information back to the client. This mode is useful for testing and debugging Web sites and applications. Specifies what happens to an existing response when the HTTP status code is an error, i.e. response codes >= 400. The existingResponse attribute can be one of the following values; the default is Auto. Leaves the response untouched only if the SetStatus flag is set. Replaces the existing response even if the SetStatus flag is set. Leaves the response untouched if an existing response exists. Adds an HTTP error to the collection of HTTP errors. Removes a reference to an HTTP error from the HTTP error collection. Removes all references to HTTP errors from the HTTP error collection.